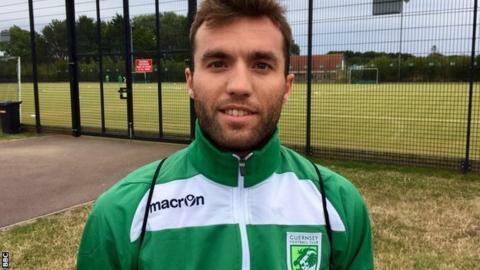 Guernsey FC have signed a former Atletico Madrid youth player after he moved to the island to work in a hotel. "I think we will have a good season and we want to get promoted," he said. "I like to pass, I like to organise the play of the team," Fernandez told BBC Radio Guernsey. "I don't score a lot of goals, but I will try this season, I like to assist and I will try to help the team." Guernsey FC were set up in 2011 and are the only club from outside mainland Britain to play in the English league system. Players have to live on the island in order to be eligible to play, a rule that scuppered a potential move for rival Channel island Jersey's top player Jack Boyle earlier this year. The island side gets average gates of almost 800, some of the highest in the eighth tier of English football - but 46,000 less than the average attendance at Athletico's Vicente Calderon. "It's a good experience for me, there's a lot of people in the stadium every weekend," Fernandez added. "I think I've adapted perfectly to this type of football and it's one of the reasons I'm here. "I like it, I think I'll have to adapt to the weather, but I think everything is going to be all right," he added.